As marching bands and fire departments took their places Monday morning in the Vergennes Union High School parking lot, Lt. Gov. 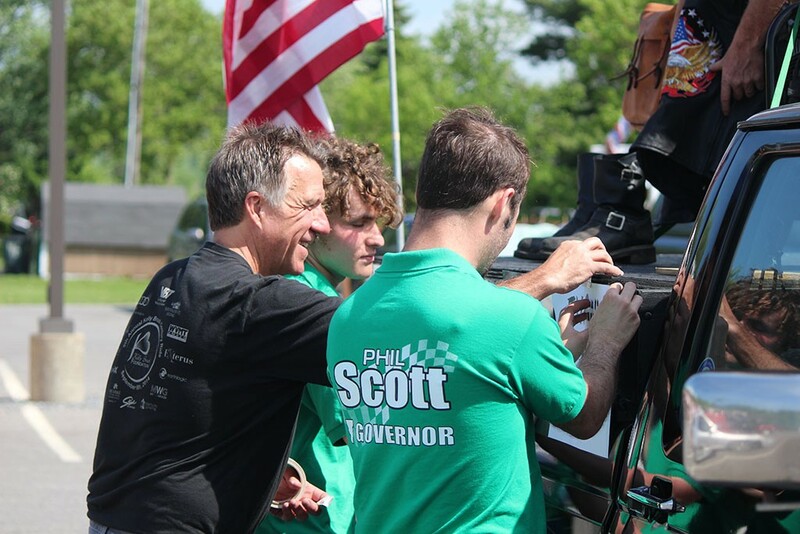 Phil Scott taped "Thank a Vet Today" placards to the sides of a campaign vehicle — a black Ford pickup truck. Wearing jeans and a T-shirt, Vermont's sole statewide elected Republican took a break to admire the vintage military motorcycle mounted to the truck's bed. It was a 1941 Indian 841, emblazoned with a U.S. Army star and featuring a holstered rifle strapped in front of the handlebars. "I've been looking for one for a while," the LG said, noting that his father had served in World War II and fought in the D-day invasion. "It's a little interesting: foot clutch, suicide shift, throttle on the wrong side so that they could get to the gun, I guess. But anyhow, it's kind of a cool bike, and it just means a lot to me." So much that when Scott bought it late last fall from a Florida man, he drove "24 hours straight" to pick it up — and then 24 hours straight back. Such spur-of-the-moment road trips might be a thing of the past for Scott, who's now engaged in the toughest race of his career: to become the Republican governor of the nation's most liberal state. That contest formally began last Thursday with the passing of a deadline for state candidates to turn in their petitions to the Secretary of State's Office. It informally began over the weekend, at Memorial Day parades in Essex Junction, Middlebury, Vergennes and elsewhere. "I love parades," Scott's primary-election rival, Bruce Lisman, exclaimed as he supervised the preparation of his own float nearby: a pickup truck featuring a massive, phallic arrow pointing toward the clear, blue sky. Inscribed on the arrow — and on most Lisman accessories — were the words "A New Direction." A single float, promoting New Haven's Smith Family Farm, separated the gubernatorial contenders in the high school's western parking lot, but the two Republicans studiously avoided one another. 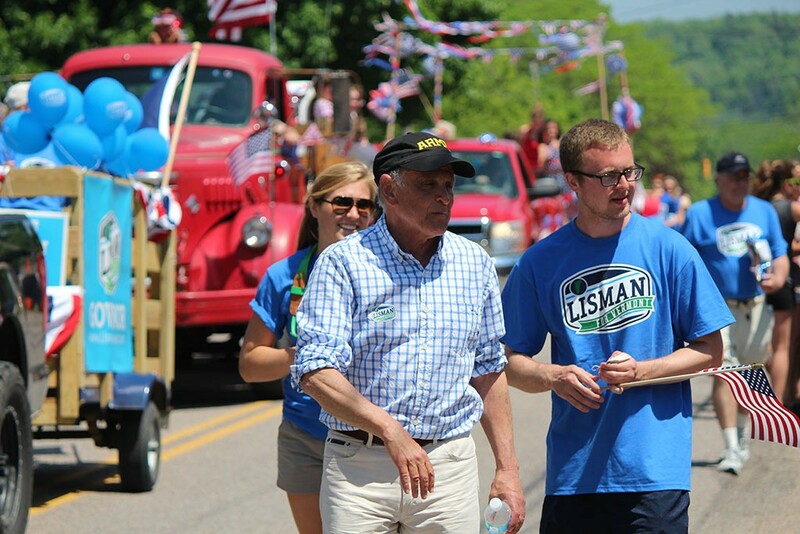 Scott was steaming over a second attack postcard Lisman's campaign had just mailed thousands of Vermonters. Like a similar one sent a week earlier, it featured a photo of the Republican lieutenant governor sharing a warm moment with Vermont's unpopular Democratic governor, Peter Shumlin. "A picture is worth a thousand words," the new mailer reads. "Phil Scott won't change Vermont's direction." Standing next to his armada of parade vehicles — the motorcycle, his Thunder Road SpeedBowl race car, a 1929 Ford Model A, a green cow on wheels and a white minibus — Scott tore into his opponent's ad. "I guess I'm not surprised. He's learned very well on Wall Street," the LG said, referring to Lisman's career at two now-defunct financial firms, Bear Stearns and Lehman Brothers. "That doesn't sound like a new direction ... He sounds desperate to me." Gubernatorial candidate Bruce Lisman marches Monday in Vergennes' Memorial Day Parade. "I can tell you our campaign is going really well," the Shelburne Republican said. "People like what I say. They like my ads. They like these things. People want new ideas." On the east side of the high school, eight statewide Democratic contenders milled about a shaded parking lot with a small crowd of legislative candidates, campaign staffers and volunteers. Shortly before the parade began, Shumlin and his wife, Katie Hunt, pulled up in a black SUV chauffeured by his Vermont State Police detail. 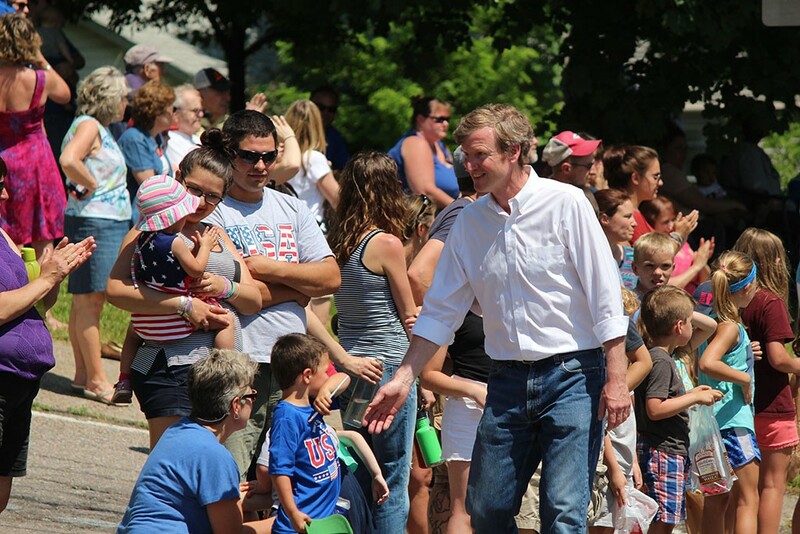 "I love this parade," the retiring governor said as he slipped out of the vehicle, wearing khakis, shirtsleeves and a green tie. "This might be my final Vergennes parade — at least where I get to march." So what tricks of the trade has Shumlin learned during his six years of gubernatorial parading? "I'd say: Be yourself," he advised. And what exactly does that mean for Vermont's one-of-a-kind gov? "For me it means, you know, I'm pretty exuberant. I like to wave and have lots of contact with folks," Shumlin explained. "Be who you are, and Vermonters will appreciate it." 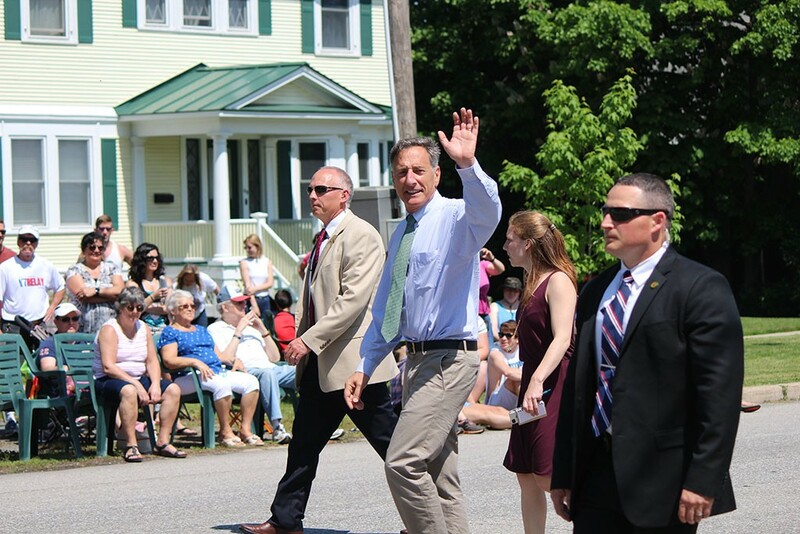 Sure enough, Shumlin waved up a storm as he marched up Monkton Road in the blazing heat. But the crowd of spectators lining the intersection with Main Street greeted the gov mostly with stony silence or tepid applause. He was accompanied not by a legion of supporters but by a couple of his own employees, including chief of staff Darren Springer, and two state troopers. The rest of the Democrats kept their distance from Shumlin, allowing the Ferrisburgh Central School marching band, the town's fire department and a crew of Civil War reenactors to go first. Far behind their party's former standard-bearer paraded gubernatorial candidates Sue Minter, Matt Dunne and Peter Galbraith; Treasurer Beth Pearce; Secretary of State Jim Condos; lieutenant gubernatorial candidates David Zuckerman and Shap Smith; and attorney general candidate T.J. Donovan. U.S. Senate candidate Scott Milne marches Monday in Vergennes' Memorial Day Parade. Pomfret Republican Scott Milne, who has always marched to the beat of his own drum, seemed to be following Shumlin's advice: He was totally himself. Four days after submitting petitions to challenge the most powerful Vermont Democrat in the past half-century, Sen. Patrick Leahy (D-Vt.), Milne ambled along the Vergennes parade route entirely alone. Wearing blue jeans and a white button-down shirt, he marched without any identifying marks: no signs, no banners, no name tag. To all but the most politically attuned, he looked like some random dad lost in a parade, trying to play it cool. Perhaps it was all part of Milne's grand strategy. Shortly before the parade began, he explained that, though he had officially joined the race last week, he wouldn't really get going for another month. "Our campaign is really going to be focused between the Fourth of July and Election Day," he said. "I think if you can't convince somebody to vote for you in five months, you probably shouldn't get elected." Another leadership contest appeared to begin last week when the Addison County Independent reported that Rep. Dave Sharpe (D-Bristol) "will be a candidate for speaker of the Vermont House." "The headline made it seem like I'm much more of a candidate than perhaps I am," Sharpe later clarified to Seven Days. "I'm exploring that option." Nevertheless, the 14-year Statehouse veteran and chair of the House Education Committee appears to be road-testing his arguments for why he should succeed Smith. "I'm a consensus-builder," Sharpe said, pointing to his work passing a major education governance bill out of his committee last year on a unanimous vote. He conceded that the bill — now a law known as Act 46 — hasn't been as popular outside the Statehouse and could be a political barrier to his promotion. But he argued that it "has, in fact, moved the state forward." Sharpe's quasi-announcement prompted one of his peers, House Majority Leader Sarah Copeland Hanzas (D-Bradford), to explicitly state what has been clear for months, if not a year. "In November, I will run for speaker," she said. "Right now, I am working to reelect a Democratic majority in the House." Copeland Hanzas, who has served in the House for a dozen years, wouldn't say much more than that, noting that legislative leadership elections don't typically take place until December. "Talking about the speaker's race is putting the cart before the horse, because the folks who elect the speaker haven't even been elected yet," she noted. That shouldn't be a problem for Copeland Hanzas, a Bradford coffee shop owner who is running unopposed in her House district. But it could be for Sharpe and a third potential candidate for speaker: Rep. Mitzi Johnson (D-South Hero). Sharpe faces a three-way primary and two Republican opponents in his two-member district, which includes Bristol, Lincoln, Monkton and Starksboro. Last election, his longtime district-mate, Mike Fisher — a fellow Democrat and chair of the House Health Care Committee — was knocked out by Republican Fred Baser. Johnson, who chairs the House Appropriations Committee, faces a four-way primary and two Republican opponents in her two-member district, which includes the Champlain Islands and a slice of Milton. She says she's "considering" running for speaker, "but there's a lot of other work to do before I get to that." "I spend four and a half months of the year worrying about the state's finances," Johnson said. "This is the time of year I have to focus on my own finances a little." It's been almost half a century since Vermont faced this much turnover in its leadership ranks. The gov, LG, speaker and Senate president pro tempore are all retiring or running for higher office. But at the legislative level, the competition isn't quite so fierce. According to a nearly final list provided by the Secretary of State's Office, only 289 major-party candidates have filed to run for the legislature's 180 seats. That's roughly 30 more than ran in the last two election cycles but fewer than the 307 who did so in 2010 — the last election to feature open gubernatorial and LG seats. In the 30-member Senate, seven incumbents are running unopposed: in the Bennington, Caledonia, Grand Isle and Windham county districts. Another three Rutland County incumbents, all Republicans, face a single Democrat, while four Chittenden County Democrats seem equally safe. Currently, Democrats and Progressives control 21 seats, while Republicans hold just nine. That's not likely to shift much, given that twice as many Ds and Ps filed this year as did Rs: 36 to 18. The partisan divide is just as stark in the House. Currently, the 150-member body includes 85 Democrats, 53 Republicans, six Progressives and six independents. Back in the 2010 election cycle, the two largest parties ran similar numbers of candidates: 131 Democrats to 107 Republicans. But this time around, 143 people are running in the Democratic primary, while only 89 are running in the GOP primary. "I'm disappointed," said House Minority Leader Don Turner (R-Milton), who had hoped to recruit 100 challengers — not including incumbents — by the end of February. "I would have loved to have had more candidates. I wanted one for every race." Turner found some reason for optimism: Only two members of his caucus are retiring or running for higher office, while 21 House Democrats are. But he conceded that it would be virtually impossible to win back the majority. According to Copeland Hanzas, who's in charge of Democratic recruitment, "We're feeling good about the number of districts we're challenging in." But that number isn't quite as high as it appears. Of the 143 candidates who filed to run in the Democratic primary, 24 plan to caucus with the Progressives. Another three candidates are running solely in the Progressive primary. Prog party leaders say they made a strategic shift this year to run their candidates in Democratic primaries, because their odds are better in head-to-head races. "I'm really excited," said Vermont Progressive Party executive director Kelly Mangan. "It's not simply quantity, of course. It's the quality of those running. And I believe we have several people who have a really strong shot of picking up seats." A number of Vermont journalists have said farewell to the Green Mountain State in recent weeks. Burlington Free Press reporter Zach Despart departed for Houston, where his girlfriend got a new job. Fox 44 Statehouse reporter Alex Rose moved to North Carolina — also to chase a woman. WCAX-TV anchor Ali Freeman hightailed it to Hollywood to, as news director Anson Tebbetts put it, "chase her dreams." And WPTZ-TV president and general manager Kyle Grimes left for Pennsylvania, where he'll head another Hearst Television station, WGAL-TV. Before he left, Grimes hired a new evening news anchor to replace the recently departed George Mallet: Brian Colleran, who currently works for NBC2 in southwest Florida. He's expected to start in Vermont in July. Closer to home, Seven Days' own Judith Levine is retiring her column, Poli Psy, after 11 years of fearless, probing writing about some of the toughest topics in the news. You can read her final installment in this issue. We'll miss you, Judith.